The VENUS project aims to develop scientific methodologies and deliver technological tools for the virtual exploration of deep underwater archaeology sites. Underwater archaeological sites, such as shipwrecks, offer extraordinary opportunities for archaeologists due to their low light, low temperature and a low oxygen environment which is favourable for archaeological preservation. However, these sites cannot be experienced at first hand and are in constant jeopardy from activities such as deep trawling. The VENUS project will improve virtual access to underwater sites by generating thorough and exhaustive 3D records for virtual exploration. The project team has surveyed shipwrecks at various depths and to explore advanced methods and techniques of data acquisition through autonomous or remotely operated unmanned vehicles with innovative sonar and photogrammetry equipment. Research has covered aspects such as data processing and storage, plotting of archaeological artefacts and information system management. The aim has been to establish a series of best practice procedures for data aquisition, dissemintaion and archiving. 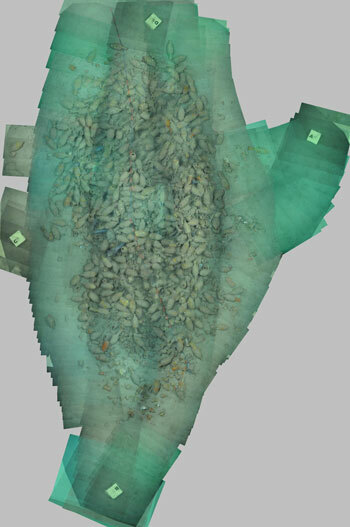 VENUS has also developed virtual reality and augmented reality tools for the visualisation of and immersive interaction with a 3D digital model of one of the projects chosen underwater sites. This model will be made accessible online as an example of digital preservation, but also for demonstrating new approaches to site investigation in a safe, cost-effective and pedagogical environment. The virtual underwater site will provide archaeologists with an improved insight into the data and the general public with simulated dives to the site. The VENUS consortium, composed of eleven partners, is pooling expertise in various disciplines: archaeology and underwater exploration, knowledge representation and photogrammetry, virtual reality and digital data preservation. The ADS are the partner with direct responsibility for the investigation of the porject's archiving strategies, as well as the development of a Guide To Good Practice on managing marine archaeological data. This exemplar archive contains some of the material collected during the third mission of the project - the survey of the Roman wreck site of Port-Miou C, near Marseille. The archive presents a representative sample of the data collected during the mission, chosen to illustrate the techniques and technologies used and the archiving strategy employed.